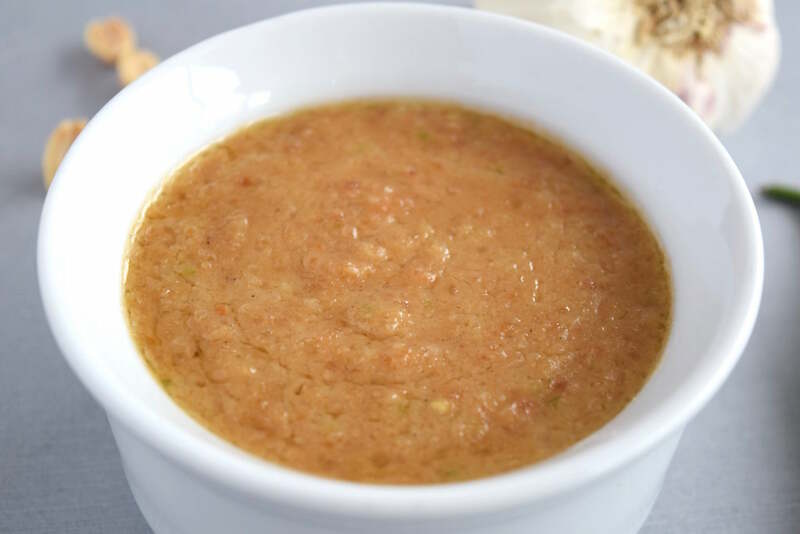 I was looking for something to make from my favorite cookbook, when I came across a recipe for peanut dipping sauce for chicken or beef satay. Needless to say, I tried it right away. Before I get to the recipe, though, I’d like to touch on some of the things the sauce could be used for. 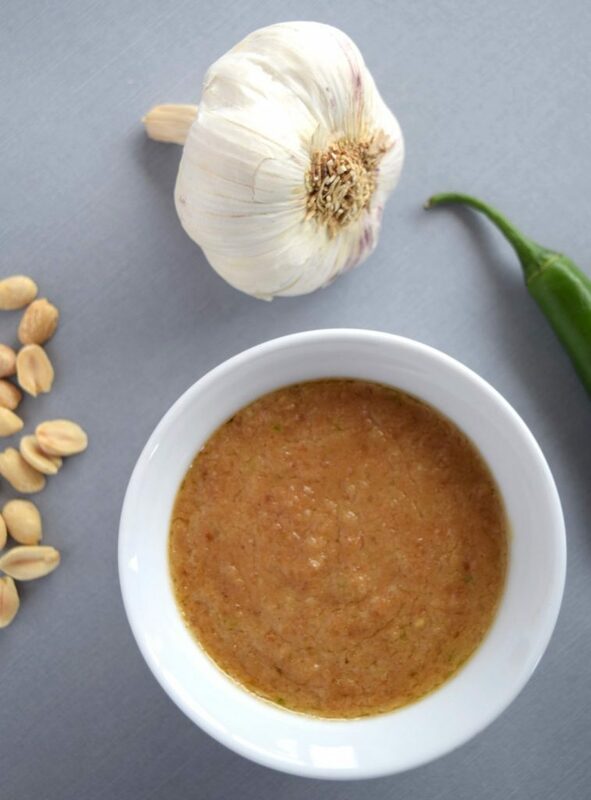 First, it is a perfect alternative to the pre-made peanut sauce that comes in a jar. Second, it is a great sauce to slowly cook chicken in, almost like a curry sauce. In fact, that’s what I did with the batch I had made. By gently simmering chunks of chicken in the sauce (with some added coconut milk), the result is a thick, flavorful curry-like dish that’s not too spicy. Alternatively, if you’re thinking of making an Asian-style pizza, this sauce is perfect as a pizza sauce base. It’s not strong enough to overpower the other toppings, and sticky enough to keep the toppings from sliding around. Accompanying toppings could include chunks of marinated chicken or ground pork, leeks, mushrooms, grated ginger, or whatever works for you. 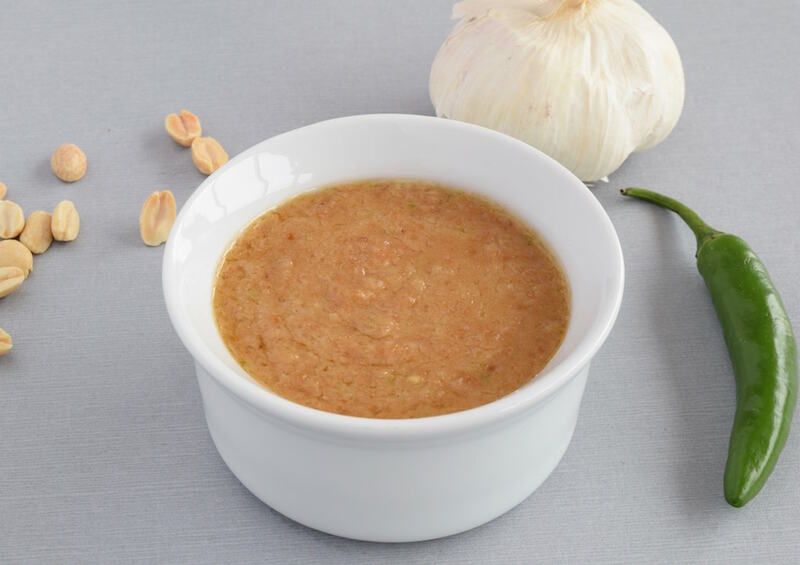 All that said, dipping your beef or chicken satay in this sauce would make the perfect appetizer or meal. Oh, yeah, its really easy to make, too. Heat a large, nonstick pan over medium heat. When hot, add the peanuts, shaking or turning often until they get some golden spots on them. This will take about 3-6 minutes. Be careful at this point, as they can easily burn and become bitter. Move the peanuts to a bowl to cool. When cooled, pulse the peanuts in a large food processor until they’re the consistency of sand. Be careful not to turn them into a paste. Next, put the shrimp paste on a piece of aluminum foil and fold it into a small, sealed packet. Heat the packet with tongs closely over a medium-hot stove burner until the packet begins to smoke a bit. After it begins to smoke, turn the packet over and heat from the other side for about another minute. After it cools, unwrap the foil. The shrimp paste should be golden with some blackened bits. Add the toasted shrimp paste (or fish sauce, if using instead), chili, garlic and sugar to the peanuts already in the food processor. Pulse to mix the ingredients, but don’t over-grind it. The mixture should maintain a sandy texture. Transfer the mixture from the food processor to the pan that you roasted the peanuts in, add the coconut milk and stir to combine. The sauce will be quite thick. Bring the mixture to a gentle simmer and cook for about 5-7 minutes or until oil spots appear on the surface. Even if you don’t get the oil spots, limit this step to 7 minutes. Add the rice vinegar and salt to the mixture and combine, followed by stirring in the water. At this point, the sauce should have the consistency of pea soup. Thick, but not like oatmeal. If it’s too thick, gradually add a bit of water until it’s the right consistency. If it’s too thin, let it gently cook down for a few minutes. Add salt if needed, then transfer to a bowl to cool to room temperature before using.